Why did the Parliament of Quebec bar longtime Drum Corps International announcer Brandt Crocker from even touching the microphone at the World Championship Finals in 1982? What are the origins of the opening phrase "On the Field …"? 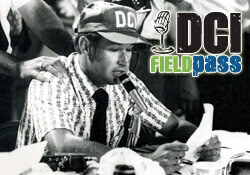 Find the answers to these questions and more in part two of Dan Potter's interview with the "Voice of DCI" in today's Field Pass. Download and listen. (MP3, 5.2 MB) Subscribe to this podcast through iTunes. RSS feed. Field Pass archive.